LeadGen Compass bundles services based on your business-to-business lead generation goals. Consider your future business needs, evaluate our pricing packages, and take note of our guarantees. See below to view our programs. If you are looking for help with a specific service like Facebook or LinkedIn, visit our Individual Pricing Page. We’ll help you build awareness in your target market and drive traffic to your website. Guaranteed. In addition to driving traffic, LeadGen Compass will focus on converting website traffic into inquiries. LeadGen Compass will fill your pipeline with qualified leads each month, guaranteed. Not every business is a fit for your products. Get your message in front of the right people. Take advantage of a free month of our traffic services and see for yourself what LeadGen Compass can do for your sales pipeline. 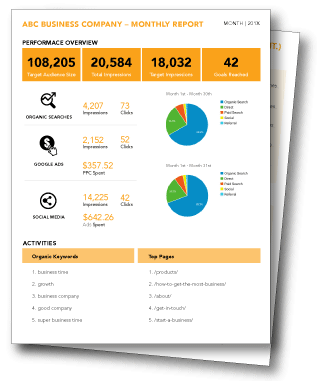 The LeadGen Compass Monthly Report is designed to help you stay on top of your online marketing. Our guide will help you understand the report so you can help us calibrate your marketing and get better results from your lead generation strategy. LeadGen Compass guarantees the quality of our work and will work to give our customers the results they want. What does this mean in practice? Simply that if you’re not satisfied with the work we’re doing or the results we’re generating, we will make it right. Even if it means a full refund. We do this by not taking on work that is outside of our scope of expertise. When we make a promise we expect to fulfill it. What are Guaranteed Sales Leads? 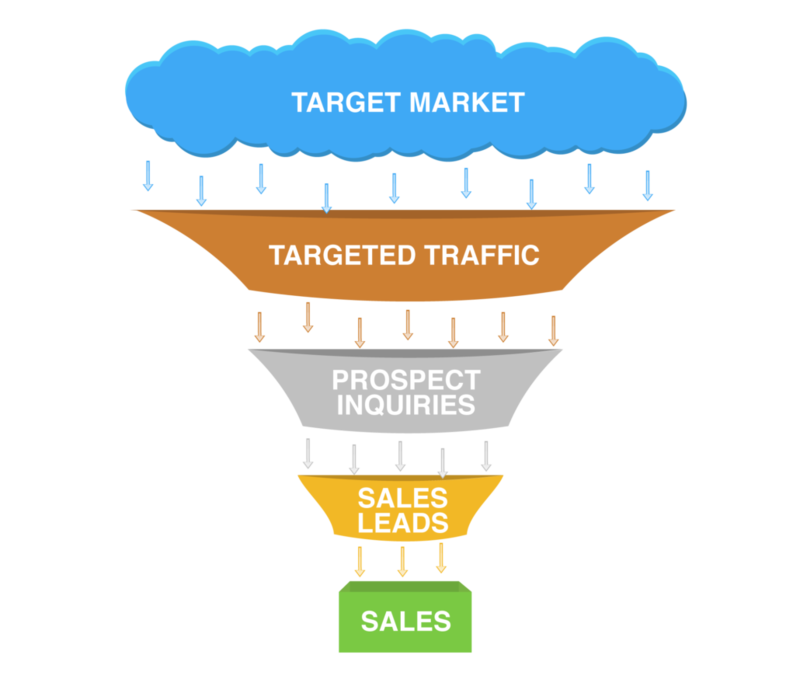 Guaranteed Sales Leads are marketing qualified/sales qualified leads according to this grid. Because we can’t control the actual sale, we will work with you to define the characteristics of a “good sales lead” and work with you to develop a scoring system that we’ll use to qualify leads. We have examples of this we’re happy to share. As a matter of fact, we’ll even show you our internal system because we score your business the same way. It’s part of how we can offer a full guarantee. Guaranteed Inquiries are marketing qualified leads. The difference between inquiries and sales leads in this program is the equivalent to the last mile challenge utilities face. The most expensive part of getting power to your home is the last mile, and to us that’s a guaranteed sales lead. Inquiries are the flow of companies and buyers that come close to you, but need to be pulled into the last mile to reach your house. We measure who is coming in and can see who is asking for information and guarantee that they are in your market. Guaranteed Traffic is traffic matches your prospect and customer criteria. It doesn’t help to double the traffic to your site if 2/3 of it isn’t who you want to attract. We work with you to identify your sales lead criteria, figure out a way to measure it, and work to increase that traffic. Yes. We need to know more about your business, but for most Small to Mid-Sized Enterprises (SME) this service is perfect for multiple sales reps.
No. We prefer that you give us 3 to 4 months to get fully ramped up because it’s a process, not an event, but if your business changes, you can make changes. We charge a month in advance for the service and if you make changes, we won’t commit resources to the coming months work. Do you have examples I can see? We do and to be relevant, we’d like to know what your industry is along with some idea about what you’re trying to accomplish. You can view our Case Studies to get an idea of how we work, and we’ll even let you talk to customers upon request. We want to help you make a good decision. Have you ever worked in our Industry? Chances are, we have. This service is best for companies that have a sales focus, versus a marketing focus. This tends to be business-to-business sales, multiple buyers, higher priced offerings. We have an assessment we can share on request and we’re happy to let you in on how we determine which companies and industries are best for the work we do. With hundreds of millions Americans on Facebook, you bet we use it to help you generate leads. We find that it works best for brand awareness and reinforcing a message. If you want to find out how we would use Facebook for your business, set up a time to talk. Google Ads are how we started helping clients. We have invested millions of dollars in Google Ads both for our own businesses and our clients. Along the way we’ve developed an approach that works well for Small to Mid-Sized Enterprises that sell business-to-business and have longer sales cycles. If that sounds like you, we should talk. If you’re selling business-to-business, LinkedIn is a target rich environment. We have developed and tested multiple approaches for using the channel and are happy to share them with you. If you’re looking for guaranteed sales leads there is a strong chance we’re going to focus on LinkedIn. Twitter has active users and millions of users, just like Facebook. We use ads on Twitter about the same way, to increase awareness and reinforce messages. Find out how we plan on using your Twitter account, or how we plan on using Twitter by giving us a call and telling us about what you want to do this year. The most popular social media channels are not always the channel where your customers are looking for solutions. Knowing that, but also knowing that your customers are there, LeadGen Compass will use the channel to increase your brand awareness or messaging. We adhere to what is called the Rule of 30, and we’re happy to talk to you about it because our customers find it helpful. Will outsourced lead generation work for me? Good question. What we do at LeadGen Compass won’t work for everyone. We have a set of criteria and assessments that help us both make a good decision because if you’re like our best customers, this will be a long term relationship. To find out more, let’s talk about your specific situation and we can give you examples that will be relevant to you. We work in US English. Yes. We do not work outside the USA for now. How long does it take to get qualified leads? The big question! How long will this take? The answer “it depends” is deeply unsatisfying but accurate. To help, we start with your average sales cycle and go from there. If your sales cycle is long, like one of our clients that has an 18-36 month sales cycle, then it can take up to half that time to generate qualified sales leads. If your sales cycle is closer to 30-60 days, you will start to see activity before 30 days are out. If you don’t know your average sales cycle length yet, work from your worst case scenario. Part of shortening the process is having past experience to learn from. We use Zapier to integrate leads but to begin, we recommend emails and spreadsheets because if you’re asking this question, it usually means you have some marketing automation set up. We need to test the initial follow up before we commit to automating responses. Were happy to share details, so please call and talk to us about what you’re working on. Not sure which package is best for your business? Talk to a marketing coach for a no-obligation consultation.